Today we’d like to introduce you to Ron Lee. Ron, can you briefly walk us through your story – how you started and how you got to where you are today. In 1982, I made my first parachute jump and was hooked. Progressing through the sport, I went to work for a fellow in 1984 who ran a parachute team that performed jumps during high school homecoming half-time events. He inspired me with his belief that the secret to happiness in life requires just three things. 1. Find something you like to do. 2. Get really, really good at it. 3. Find someone who will pay you to do it. I discovered that I liked performing skydiving shows, and thus my (then girlfriend, now wife) founded Skydiving Innovations in 1986. I performed dozens of shows for high schools and small community events in the early days, and then began to perform for more serious and demanding clients. 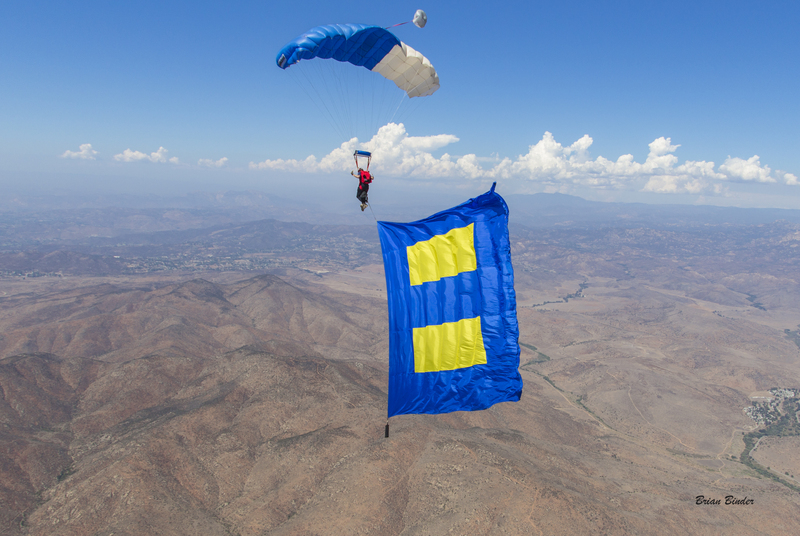 In 1988, we began executing sophisticated aerial demonstrations for corporate clients, and were approached by several members of the Navy’s elite Leap Frog Parachute Team. (The Leap Frogs are the Navy’s tier-1 recruitment vehicle, then staffed exclusively by SEALs, performing thrilling demonstrations at air shows, colleges, etc. )They wanted to work with us, (on their own time, not as representatives of the US Navy), and to bring their significant skills to our company. The addition of these incredible patriots has been a gift to us and our company, and many of them have become life-long friends. We consider ourselves blessed to know and work with these extraordinary individuals. Through the years, our company, personnel and skills have evolved, as have our service offerings. Based largely on the skillsets of members of the Naval Special Warfare community of SEALs and Special Boat Teams, we have extended to include corporate teambuilding, shooting programs, VIP Tandem Skydiving adventures, rappel performances, public speaking, aerial sequences for movie and television programs, aerial videography and of course, skydiving demonstrations. Our latest offering is FAA-certificated professional drone imaging services. 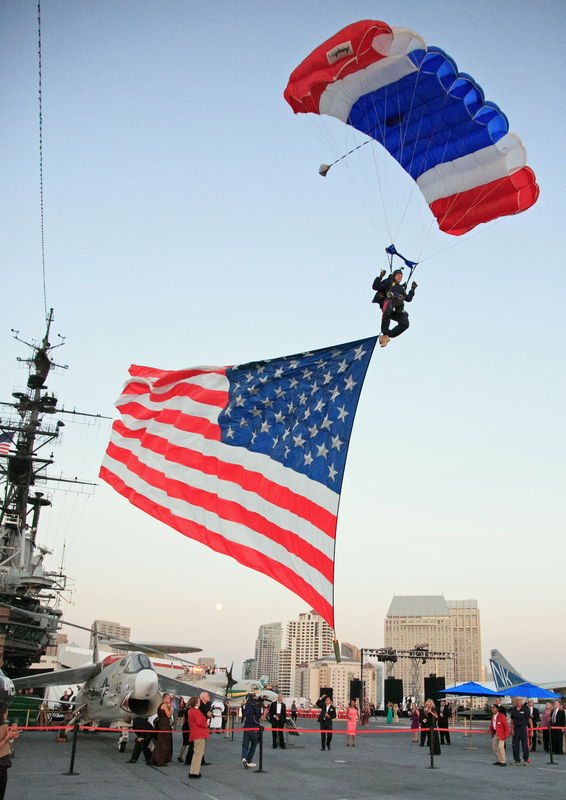 Since 2005, Skydiving Innovations has served as the USS Midway’s exclusive provider of skydiving and rappel entertainment for Midway’s corporate events. As of 2017, we have served as their provider of their drone imaging services. Since 2015, Skydiving Innovations has served as the Hotel del Coronado’s exclusive provider of aviation entertainment, and recently was signed on as the hotel’s preferred provider of drone imaging services. In its 32-year history of providing compelling and meaningful aviation entertainment, Skydiving Innovations has set several records. 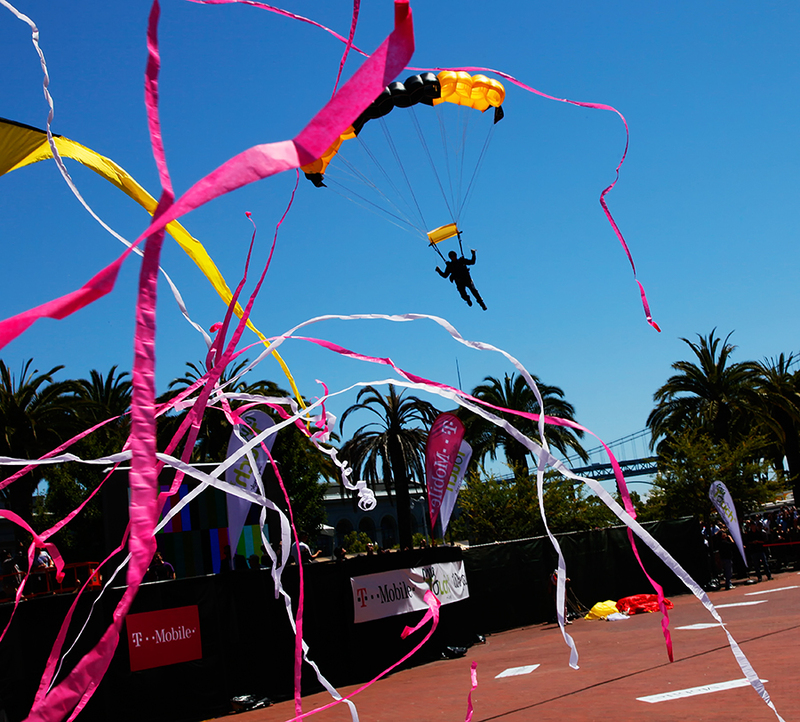 These include the largest demonstration skydiving show in any US metropolitan city, when it put 100 professional skydivers in the air at one time over San Francisco’s Embarcadero for a T-Mobile branding event product introduction. 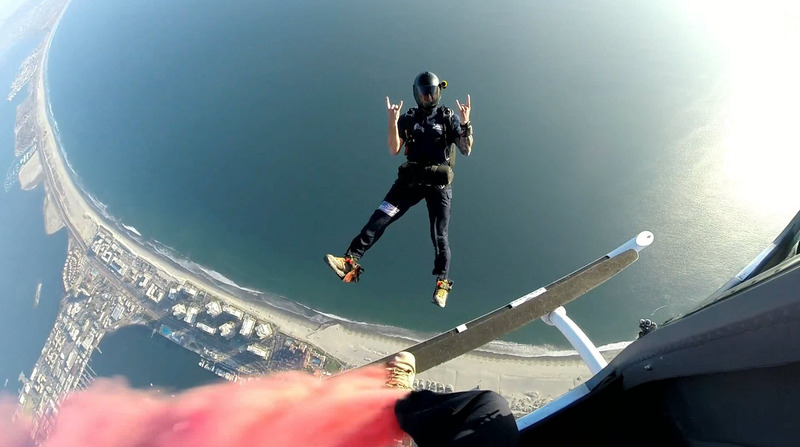 For the last several years, the company has integrated live HD video into its skydiving shows, and pioneered the delivery of this vicariously thrilling first-person video to a variety of social media platforms. 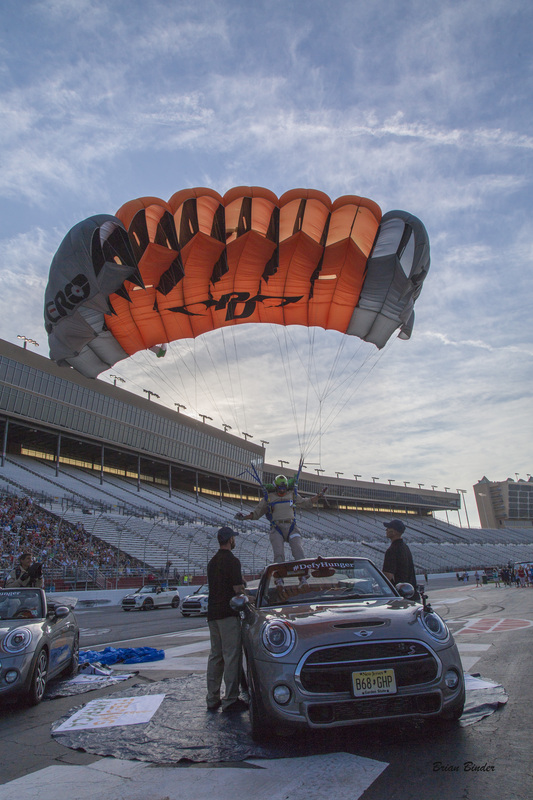 This integration has allowed Skydiving Innovations’ clients to extend the reach of their events beyond the walls of the venues at which the team performs, and deliver personal connectivity with followers on social media. Skydiving Innovations has within its ranks a team of accomplished, engaging and compelling public speakers, all with their own incredible stories and experiences to share. As with all other SI program elements, many, but not all of our speakers are members of the Navy’s elite Naval Special Warfare community of SEAL’s and SWCC’s. Speakers include retired members of the community from Chief up to Vice Admiral, all with lifetimes of experience and leadership in the “cannot-fail” environment of Special Operations. All of our speakers, military and civilian, bring breathtakingly relevant, meaningful content and expertise to audiences based on their specific life, career and business experiences. As with all S.I. programs and services, speaking engagements are customized to the stated goals of our clients, and result in useful and insightful takeaways for every attendee. Skydiving Innovations is firmly aligned with and supports the SEAL Family Foundation as its primary beneficiary of contributions from the team and clients alike. It has been, at times, anything but smooth, and for reasons we could not originally imagine. To build a business based on the provision of skydiving entertainment for corporate clients, it requires the client to see and believe in the value in what you are providing. While most businesses have competitors that provide substantially similar services that are often similarly priced, and therefore the determining factor is service and reputation, our situation is quite different. Weekend skydivers, that is, those who skydive for fun, have a history of performing skydiving demonstrations (“demos”) for little or no cost. We call it the “case of beer demo”, They do this because they love the attention, The joke is you can get a fun jumper to jump in to your event for a case of beer. While that axiom has changed a bit over the years, the essence is still true: you can get a “fun jumper” to jump into your event for very little, as their reward is the ego satisfaction they get from performing in front of a crowd. Thus, our competition is often the low-ball skydiver who charges very little. The fact is that there is an enormous difference between professional demonstration skydivers (and performances), and fun-jumpers. The general public and corporate clients often do not know the difference and can often select based just on the cost of the show. This is as though two air conditioning vendors provided quotes, and one of them was 15% of the other quote, just because he likes selling air conditioners. This is an unsustainable business model. 1. Jump, Land, Wave and Say Goodbye. This is the quick show, five minutes of pre-event or pre-game entertainment, after which the jumpers are off the field and gone. There is no residual benefit to the client. 2.Integrated, Brand-driven Skydiving Performance with Lasting Affect. This is a performance that is engineered to elicit a specific outcome that has been provided to us by our show client. 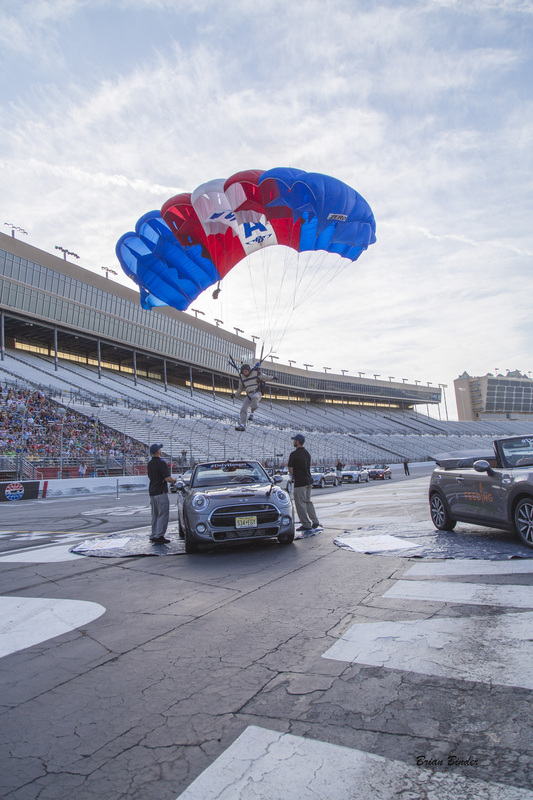 The outcome often relates to important branding and messaging elements that are tied in with the skydiving show. We always ask our clients: “What do you want people to have in their heads when they leave the event?” Based on the answer to that question, we reverse-engineer how to “get people to that place in their heads.” This results in a much more compelling, meaningful and memorable experience for spectators, and a deliverable outcome for our clients. An enormous challenge we face is the ongoing theft of National Airspace by corporate interests. By law, the FAA has sole jurisdiction over the use of and access to National Airspace. After 9/11, however, lobbying interests working on behalf of MLB, NFL, NASCAR and Disney interests were able to get legislation passed that locked legitimate airspace users out of the airspace around stadiums and Disney parks. This was done under the guise of “national security”, but was really just about keeping banner tow airplanes out of sight of stadium and Disney park visitors. The banner tow industry has always been an inexpensive way for businesses to advertise to these static audiences, and since the law was changed in 2002/2003, banner tow planes (and all other legitimate non-airline airspace users) have been subject to Temporary Flight Restrictions around these venues. 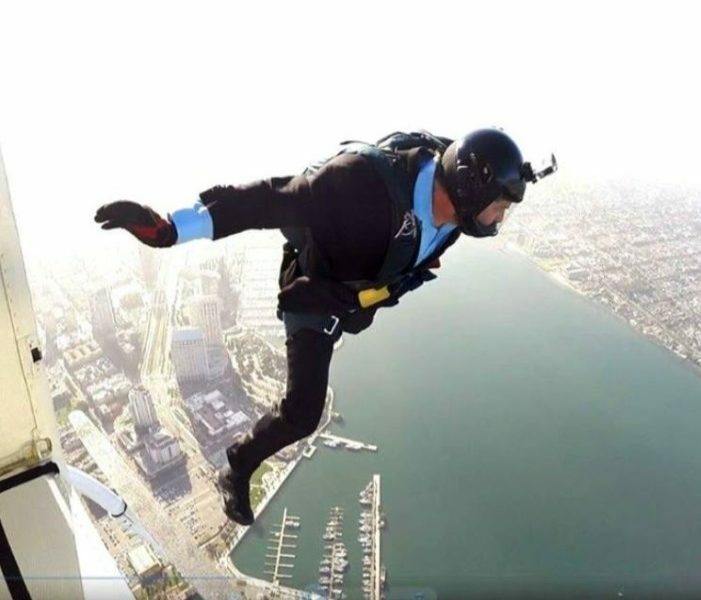 For Skydiving Innovations, the Temporary Flight Restriction around Petco Park has been disastrous. From April to October, we turn away 3 – 10 shows a year just because the time of the skydiving performance (at the USS Midway or Hotel del Coronado) would fall within the “one hour before to one hour after the game” flight restriction for a scheduled Padre game. The answer to this issue is coming through the FAA and sympathetic ears in Congress, though it is just taking a long time. So let’s switch gears a bit and go into the Skydiving Innovations story. Tell us more about the business. We remain incident/accident/claim-free in all 32 years of operation. This is no small feat, given the business we are in. It is a testament to our perspective about safety, and the skills of the performers, pilots and support personnel we are fortunate to work with. Like most companies, we are not happy just doing the same thing over an over. We love to create and innovate. We work hard to see over the horizon and understand what opportunities lie ahead. 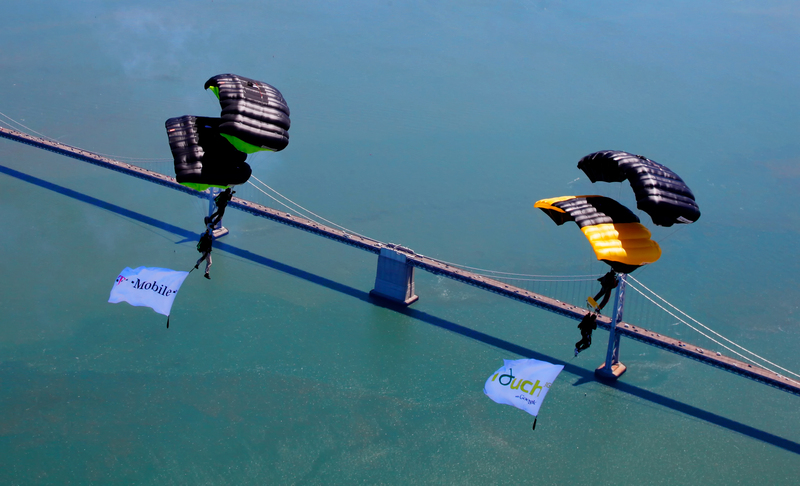 While we started as a skydiving demonstration company, we’ve grown and evolved and now provide much, much more. We love to inspire our clients and their guests. We have all met people who have said, “Oh, I could never jump out of an airplane! I’d be too scared!” That attitude changes once they realize that we had to make our first jump, and never expected to be a professional skydiver. We remind them that anything is possible if one wants it bad enough. We are very proud of and thankful for the partnerships we have built over the years. These have allowed us to grow our business and provide our brand of entertainment at tier-1 venues. Ours is really a niche business. More to the point, it is the application of our services to a niche market. Growth for us will come from increasing the number of partnerships we engage in, and continuing to develop ways for our clients to measure success with what we do. Overall, it is all about spectator engagement, so our efforts are all geared towards that connection with spectators.